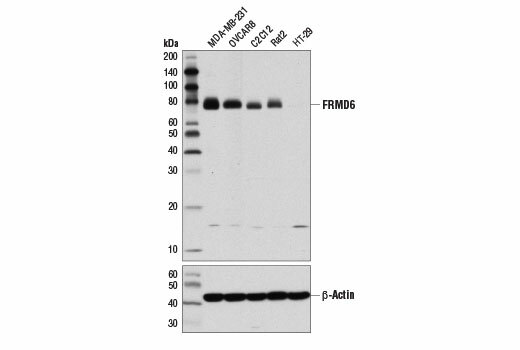 FRMD6 (D8X3R) Rabbit mAb recognizes endogenous levels of total FRMD6 protein. Monoclonal antibody is produced by immunizing animals with a synthetic peptide corresponding to residues surrounding Phe608 of human FRMD6 protein. FERM domain-containing protein 6 (FRMD6, Willin) belongs to the 4.1 superfamily, a group of proteins characterized by the presence of a Band 4.1, Ezrin, Radixin, Moesin (FERM) domain in the amino-terminal region (1). Members of this protein superfamily, which also includes Merlin, Ezrin, Radixin, Moesin and Talin, function primarily as adaptor proteins that link plasma membrane-associated proteins to the actin cytoskeleton (2). FRMD6 is considered orthologous to the Drosophila Expanded (Ex) protein, which is a 4.1 family protein that functions together with Merlin and Kibra to regulate Hippo signaling, upstream of the Salvador/Warts/Hippo core kinase cassette (3). Research studies suggest a similar role for FRMD6 in regulating the Hippo pathway in mammals. For example, ectopic expression of FRMD6 leads to increased phosphorylation of MST1/2, LATS1, and YAP, which is indicative of Hippo pathway activation. Loss of FRMD6 expression in MCF10A cells induces a phenotype change resembling epithelial-mesenchymal transition (4). Gunn-Moore, F.J. et al. (2005) FEBS Lett 579, 5089-94. Hamaratoglu, F. et al. (2006) Nat Cell Biol 8, 27-36.